Due to Tropical Storm Harvey, today’s FUELSNews will only feature one article. Our second article will come as a FUELSNews Storm Alert update on the latest fuel impacts of the storm. Crude prices continue to take a beating, with prices falling to $46.11 this morning, a loss of 33 cents (-.71%) from yesterday’s close. With crude stranded with producers in the Gulf with no demand, markets are expecting a rush of supply once the storm situation calms down. 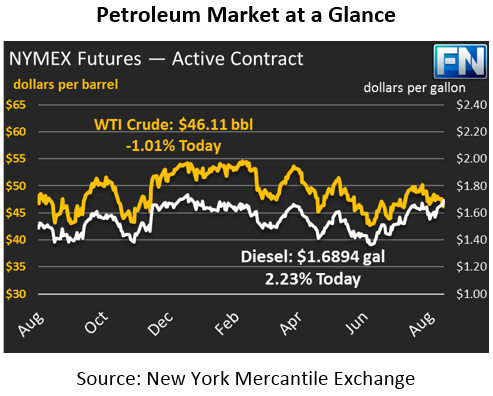 Gasoline was the biggest winner of the day – after gaining five cents during yesterday’s trading session, NYMEX gasoline prices soared another 10 cents today, to their current level of $1.8762. Yesterday, Motiva’s Port Arthur refinery, the largest in the country, announced it was shutting down due to storm conditions. Now over 23% of the entire U.S.’s refining capacity is offline. With nearly a quarter of the U.S.’s refining offline, large increases in fuel prices should not be unexpected. Diesel prices also rose yesterday, by a more meager 2.4 cents, and are today $1.6894. The API reported a 5.8 MMbbl crude stock draw last week, which would have impressed the market if it wasn’t so incongruous with the current situation in the Gulf. Inventory reports measure the previous week, so the API’s report on Tuesday did not capture most of the devastation from Harvey. Diesel stocks reportedly fell .5 MMbbls, while gasoline stocks rose by .5 MMbbls. Next week’s inventory report is sure to bring large crude stock builds mixed with steep draws to gasoline and diesel. While the media has had its full attention on the Gulf, Saudi Arabia and Russia have begun pushing to extend production cuts through June 2018, a three-month extension. Recall that OPEC extended the 2017 production cuts through March 2018, which led to a $2 drop in crude prices at the time. Markets are worried about OPEC’s exit strategy – what happens after cuts expire? While a three-month extension would delay those fears, it would not change the underlying fear in the market of what happens when OPEC goes back to full production. 23% of U.S. refining capacity is offline. The storm has made landfall for the final time, just west of Cameron, Louisiana. The Colonial Pipeline, which supplies the entire Southeast fuel supply has announced that they do not have enough product being supplied from the Gulf, and as such are expecting significant delays in pipeline shipments.